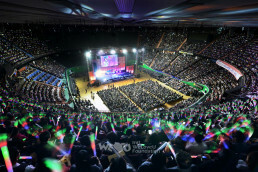 At the aT Center [Agro-Trade Center Seoul], the 2004 Kimchi Expo was being held for four days. At the exhibition hall of the first floor, kimchi and other fermented food and related instruments were displayed. At the square before the exhibition hall, some volunteers from Red Cross and other volunteers were making kimchi. Around 11 a.m., over 100 volunteers in orange vests and yellow aprons began to gather at the square. 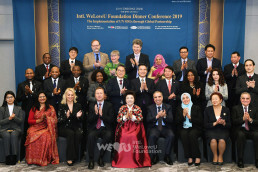 They were the members of the New Life Welfare Foundation; they were invited to the “Kimchi Relay of Hope” held by Korea Red Cross, Seoul Metropolitan Government and Munhwa Newspaper. They were mostly housewives called “Kimchi Veterans” and volunteered to make kimchi at their own expense to help senior citizens living alone, parentless households and the disabled. After a while, two tents prepared by the foundation were set up, but still space was not enough. So the host offered one more tent. Into the tents tables were moved and covered with vinyl. Then the members started to make kimchi, wearing sanitary gloves and cabs. Chairwoman Zahng Gil-jah, who was making kimchi with the volunteers, wished the neighbors who would eat this kimchi, to have courage and become healthy, saying, “As it was getting cold, I just wanted to help our neighbors in need by making them kimchi.” Then she asked the members to be more concerned with neighbors as the economy was getting worse. The joy of housewife volunteers was as great as that of children; a housewife making kimchi for the first time in 10 years because her parents always sent kimchi to her, and a skillful housewife who had made kimchi for 30 years . . . They all made kimchi wholeheartedly, thinking of neighbors in need. Some passersby even stopped and asked for a piece of kimchi for a taste or asked if it was for sale. 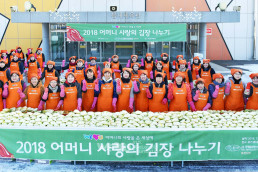 In two hours, the members completed making kimchi with the given amount of cabbages—2,500 heads of cabbages. 10 heads of cabbage kimchi would be delivered to each household, then a total of 250 households could receive the kimchi. 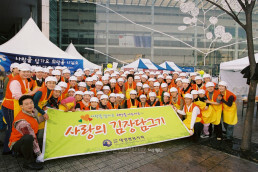 Nevertheless, the volunteers looked regretful that they couldn’t make more kimchi. Comforting their regretful mind, they shared coffee and tea, which they had prepared, with the volunteers from other organizations and passersby around them. A cup of hot tea warmed the heart of people in the quite chilly weather. As it gets colder and the economy gets worse, the love of people, who are concerned about neighbors in unfavorable situations and share even small things with them, are melting down the cold of winter.